Keirsey goes on to say that NF types seek “a Soulmate” with whom they can have this “deep and meaningful” relationship. He also notes that “Idealists are asking their spouses for something most of them do not understand and do not know how to give” (p.146). As a single INFJ longing for romance, that’s one of the most depressing things I’ve ever read. It’s like we’re setting ourselves up for romantic failure. Of course, I suspect most people have ideas about romance that don’t exactly match the reality. Because no human being is perfect (including us), we’re never going to find a “perfect” relationship. But we can commit to building a good relationship with a good person if we can figure out which expectations to let go of and which ones not to compromise. 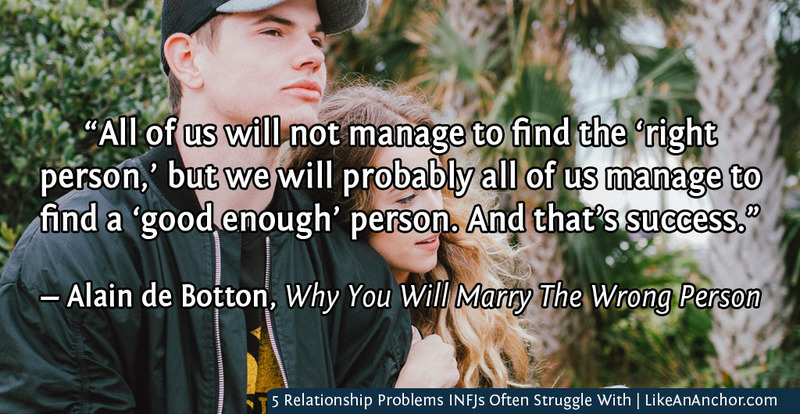 INFJs with models of good relationships in their lives and who’ve been taught the value of boundaries might not struggle with this point very much. 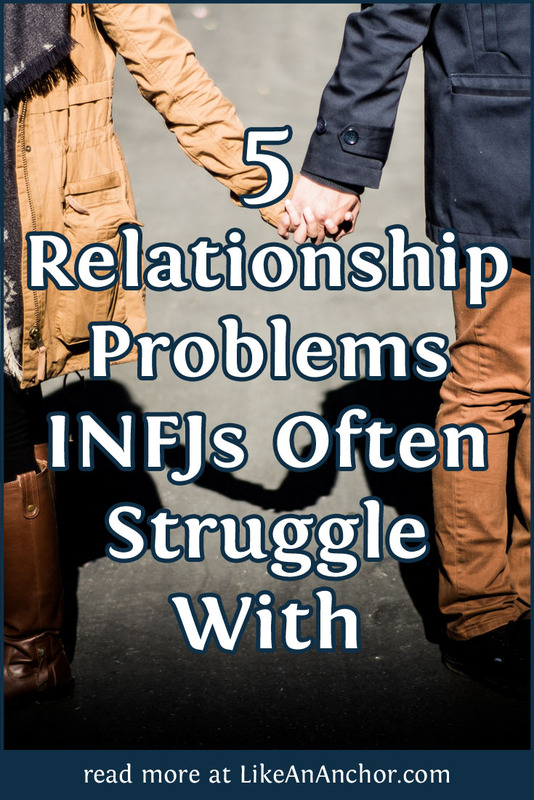 But for INFJs who aren’t sure what a good relationship looks like or who have difficulty articulating their needs and enforcing their standards, recognizing and getting into a healthy relationship can be tricky. An INFJ who’s not sure what kind of relationship they want, or who suspects they’ll never find the relationship they need, might settle for a bad relationship or they might avoid relationships entirely. Worse-case scenario, INFJs can end up in unhealthy, manipulative, and even abusive relationships. 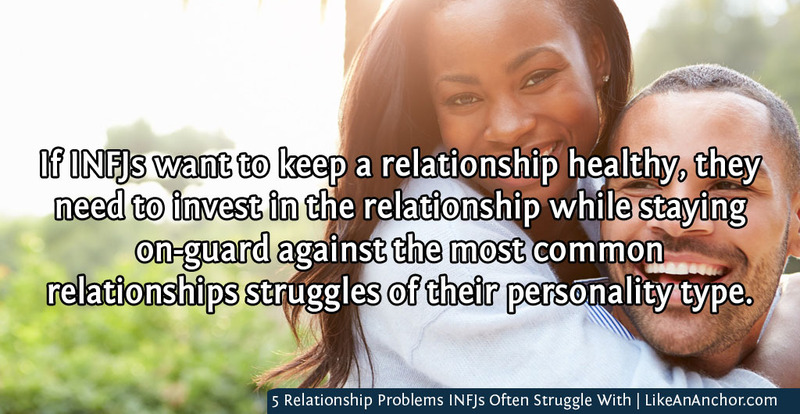 Even after INFJs find a relationship or friendship that they want to keep, maintaining it can be a struggle. We INFJs have a tendency to “vanish,” and that can have a profound impact on our relationships. I guarantee that even in a good relationship the INFJ will get distracted by the worlds inside their own heads and may cancel plans, respond very briefly to communication attempts, or even ignore their partner entirely. Some INFJs do this very rarely, other quite frequently. It’s easier to do in long-distance relationships, though INFJs can also check-out even if the other person is in the same room. A certain amount of this should be understandable — INFJs are introverts and we only have so much social energy we can expend before we need to get back inside your heads and recharge. However, sometimes INFJs can struggle with staying present enough to maintain strong relationships. If we want to keep our relationships healthy, we need to be on-guard against spending so much time in our heads that we neglect the people we love. And if you find yourself doing that a lot, then maybe it’s time to take a good look at your life and relationships, and figure out if you’re using your imagination to escape from something that really should be addressed in a more productive way. The problem of being too agreeable can affect all of an INFJ’s relationships. We agree to things with friends that we don’t really want to do because we don’t want to hurt their feelings. We stay silent when someone suggests something we’re not quite okay with because we don’t want to deal with the conflict. In certain situations, especially with casual acquaintances where we can more easily back-out of things, this might not cause too much trouble. But INFJ conflict avoidance and agreeability can show up in close relationships as well. We do want harmonious relationships, of course, but when you compromise in a close relationships it should come from a place of mutual understanding and willingness to work together, not from the INFJ being scared of honesty. As INFJs, we need to learn how to balance our desire for harmony with our need for conflict resolution and boundaries. You can’t have close relationships with people who you always agree with just because you’re scared or exhausted to try working through your differences. It’s a struggle for INFJs, but we need to give ourselves permission to be honest about our boundaries, about our thoughts, and about what we need in relationships. And we also need to learn that conflict can be a good thing when it’s used to create stronger harmony. Though we might seem reserved at first, INFJs are passionate people. We love to connect with others, but we can take that to an unhealthy extreme. Sometimes we give too much of ourselves much too quickly. We’re naturally empathic, and we might actually ignoring warning signs in a relationship because we’re so convinced that because we truly understand this person things will work out. We might also start to integrate ourselves into the other person’s life so much that they see us a clingy and we start to loose track of our own sense of self. On the flip-side, INFJs can be very slow to trust. We know that when we do trust someone and enter a relationship with them, we’re going to intertwine our lives with them so much that they’ll have more opportunities to hurt us than anyone else. We’re scared of making the wrong person such an integral part of our lives, often because we’ve been hurt by so many other people who broke our hearts. These might seem like two separate points, but I think it’s really two sides of the same issue. And they can both show up at the same time as an INFJ flip-flops between merging with the other person and trying to hold them at arm’s length emotionally. But instead of keeping the INFJ safe, these trust imbalances confuse their partners and create more problems in a relationship. It’s vital that INFJ learn to balance their desire to be “all-in” to a relationship with their need to build trust over time. What relationship struggles have you had as an INFJ personality type or as someone in a relationship with an INFJ? Please share your thoughts in the comments! I (an INTJ) have written to you before about my (long-distance) INFJ friend and some of the things she has done that have confused/frustrated me. The most recent example is that she contacted me last December to arrange a Skype chat in January. She didn’t show up for the chat at the agreed-upon time, and I haven’t heard from her since. She never followed up with me to reschedule or to explain why she missed the chat. Who DOES something like that, especially to someone that might be considered a “friend”…?